At OBLF, user support starts when the spectrometer is commissioned on site at the customer’s premises by our highly skilled service engineers. 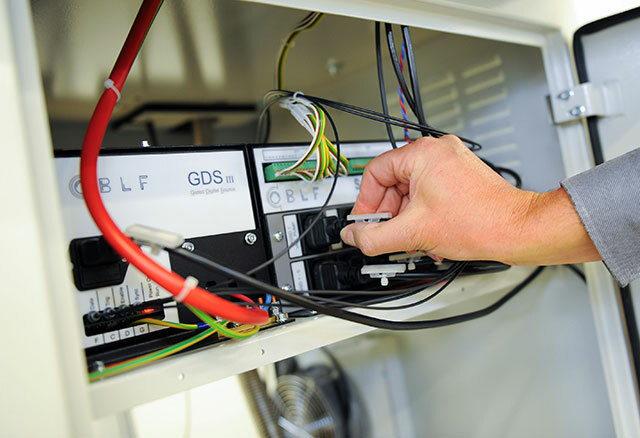 Next to the provision of in-depth user instructions and training, the commissioning process includes comprehensive testing of the device functions together with the customer. If required, user-specific adjustments can also be made at this point. On request, we can also run preliminary acceptance tests at our premises. Spare parts remain available for a minimum of 10 years following delivery and can be ordered by telephone, email or in writing from OBLF or the respective representation abroad. Please use our contact form for email orders. Our spectrometers can be modified on site at the customer’s premises to respond to changes in analytical tasking. Software upgrades, calibration extensions and installing customer-specific data are naturally also possible. User training can be provided at the premises of OBLF or the customer on request. Please contact our service team to schedule a date. Do you need preventive maintenance? Contact us and we will make an appointment. OBLF also offers service contracts and calibration surveys. These are usually fixed for defined intervals, e.g. annually. We will contact you previously to the upcoming service and will fix an appointment date. After the performed service you will receive a maintenance protocol including the taken measures. The instrument will get a service tag where the next renewal date is indicated.